Fill them with popcorn! It's easy. Remove the metal top. 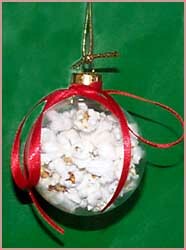 Place 15-25 kernels of microwavable popcorn in the ornament. (Wipe off some of the oily gunk first.) Place the ornament in a paper bag and put in the microwave for 1-2 minutes. Listen carefully, you may not need to leave them in for a full two minutes. When the popcorn is done popping, remove the ornament carefully, it will be hot. Sprinkle some glitter in if you like. Tie a pretty ribbon on the top and hang from your tree. Fill with shells and sand for an interesting beach look. Fill with silk fs. Take apart some colorful silk fs and stuff them down the neck of the ornament. Fill with tinsel. Use different colored tinsel, pieces of old garlands. Add some of those shiny cutout shapes they sell to insert into greeting cards and packages as a nice addition. Sand Art! Fill with layers of different colored sand. Paint / Marble the inside. Put a drop or two of paint into the ornament and swirl around to coat the inside. Use more than one color, either at the same time, or one color at a time (letting each dry in between). Experiment with your paint - too thick and it will just sit there in a blob. Too thin and it won't adhere to the side of the ornament. 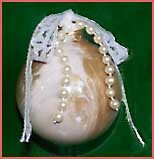 Try using a straw inserted into the neck of the ornament to blow the paint around, or drop a small bead into the paint and swirl it around the inside of the ornament. Glitter / glue - easy for kids to do! Just draw a design on the outside with white glue and sprinkle glitter on. Attach to tree lights. Take off the metal cover, insert the light (the small kind) into the ornament. Carefully replace the cover over the light wire. Fill them with potpourri. You'll need to crumble the potpourri up fairly fine in order to fit it into the neck of the ornament. Hang next to a light on your tree to warm up the potpourri and release the scent. Fill with odds and ends. Take all those little scraps left over from other projects - pieces of pearl strands, red felt, buttons, all kinds of scraps. Sprinkle in a little silver or gold glitter. Where to Get 'Em:- Online, try The Christmas Depot. 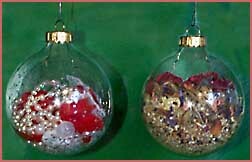 They have clear glass ball ornaments in sets of 4, or 6. They also sell by the case at discount prices. Also check your local craft store, or a discount craft supply catalog. Lois, rich.hand@home.com, says: Instead of buying brand new ones, take old scratched balls (or new ones) and soak them in full strength bleach for several minutes. Rinse with warm sudsy water. Newer balls have a plastic like film on the outside that will slough off. Bleach will remove the silver color inside the ball. You may need to use a Q-tip to get all the silver out. It's a lot cheaper than buying clear balls. Thanks Lois!